One of our most popular bedding sets ever. This is such a beautiful Southwestern bedding set. 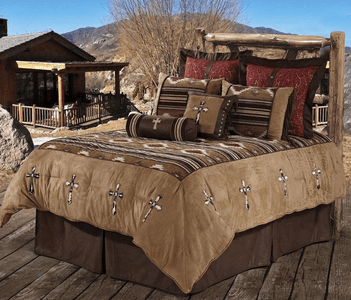 Gorgeous looking desert colors beautiful tapestry fabric cowhide cross Western bedding. Professionally assembled bed in a bag. All is included but the euro shams and cross pillow. You get the comforter, two standard shams(king set comes with king size shams) one neck pillow and a matching dust ruffle.